The main parts of a telescope are: the optical tube assembly, the eyepieces, the mount, and the pier. As far back as 1200 A.D., people had experimented with lenses and magnifying glasses. The first telescope was put together out of spectacle lenses by a Dutch optician, Hans van Lippershey in 1608, but he regarded his new invention as only a toy, or at best a novelty for amusement. Word of this development soon reached Italy, and an Italian astronomer, Galileo Galilei, thought that such an instrument could be used to look at objects in the sky. He therefore obtained some lenses and a tube of lead, and constructed his first telescope in 1610. Over the following years he improved his telescopes, but the best one only magnified 33 times. Its field of view was so narrow that only a quarter of the diameter of the Moon could be observed at a time. But he made some outstanding discoveries all the same: the craters and mountains on the Moon, the four Galilean satellites of Jupiter, the ring of Saturn (at the limit of his equipment), and the stellar nature of the Milky Way. In the following years, people built larger telescopes to gain increased light-gathering power and magnification. Because the simple glass lenses acted like prisms, they refracted or broke the light up into its component colours. If a lens was used to bring yellow light to a clear focus, then the object being observed had red, blue and purple fringes. These coloured haloes made the observation of fine detail very difficult. The problem is called chromatic aberration, and is common to all simple lenses. These types of telescopes, which have a large lens at the front called the objective lens, and a small ocular or eyepiece at the back for looking into, are called refracting telescopes or refractors for short. Binoculars are two small refractors mounted side by side. The magnifying power of a telescope is determined by dividing the focal length of the objective by the focal length of the eyepiece. Early observers found that they could increase the magnification by either increasing the focal length of the objective (making it flatter), or by decreasing the focal length of the eyepiece (making it smaller and rounder). The first option was the easier to manufacture, so there appeared in the latter half of the 1600s immensely long telescopes which had lenses of modest aperture but enormous focal length. They were extremely unwieldy, but even so, Cassini was able to use one to discover the division in Saturn’s ring that today bears his name, and Huyghens was able to see dark areas on Mars. It was not until about 1750 that the English optician J. Dollond discovered a method of making a lens that did not produce spurious colour fringes on images. His idea was to use two lenses bonded together instead of a single lens. The two lenses were made of two dissimilar types of glass, crown and flint, and fixed together as a unit, called a doublet. Each type of glass produced its own aberrations, but when put together the aberrations cancelled each other out. Such a lens is called an achromatic doublet. For complete elimination of chromatic aberration, the eyepieces also have to be achromatic doublets or triplets. At about the same time, another Englishman, Isaac Newton, found a way to replace the objective lens in a telescope with a mirror. As the mirror was coated with silver on its top surface, the light did not pass through it, so there was no chromatic aberration. The problem of colour fringes caused by the objective was therefore solved, though chromatic aberration could still be introduced by using single-lens eyepieces. This was the birth of the reflecting telescope, this type being known as the Newtonian reflector. In the Newtonian, the light enters the open top of the tube and passes through to the bottom, where the primary mirror is held in a cell. The light is reflected back up the way it came, but as the primary is not flat but curved in a shallow parabola, the light is converging towards a focal point. A small diagonal flat mirror is held by a metal support system called a 'spider' in the optical path near the top of the tube, at an angle of 45o. It deflects the light through a hole in the side of the tube, where an eyepiece holder is mounted. An eyepiece is inserted here at the primary mirror’s focus. Disadvantages: open tube, with possible air currents, optics have to be collimated (realigned) periodically due to movement in the spider caused during transport, the diagonal mirror is an obstruction that degrades definition. Nowadays, there are other types of telescope that combine some of the advantages and disadvantages of both refractors and reflectors. Some of these are the Cassegrainian, the Schmidt-Cassegrainian, the apochromatic refractor, the Maksutov, and the Ritchey-Chrétien. The Anglo-Australian Telescope in N.S.W. is a Ritchey-Chrétien with a primary mirror of 3.9 metres diameter. Three things need to be considered when choosing eyepieces: magnification, field of view, and eye relief. A set of eyepieces is needed to give a range of magnifications from low power, wide field views of large objects such as the Orion Nebula, to high power views of the Moon and planets. Changing eyepieces usually requires re-focusing the telescope. Eyepieces from one manufacturer which are made so that they can be interchanged without re-focusing are called parfocal. Various types of eyepieces, in ascending order of quality and cost, are: Ramsden, Huyghens, Kellner, Orthoscopic, Erfle, Plossl, Televue, Nagler. Low-power eyepieces are generally dearer, as they use larger lenses. It is easy to spend over $1000 on a Nagler eyepiece. A Barlow lens is a cheap way of doubling your range of eyepieces. It is inserted between the regular eyepiece and the eyepiece holder, and doubles the magnification of the regular eyepiece. The optical tube assembly is placed on a mount to enable it to be conveniently pointed at any part of the sky. The simplest mount swings up and down (in altitude) and horizontally round a central pivot (in azimuth). For obvious reasons it is called an alt-azimuth mount. It is recommended for simple telescopes, and has returned to popularity in recent years in a variation known as the Dobsonian. The Dobsonian uses wooden parts, the bearings being teflon strips. It is robust, light, and easy to set up. 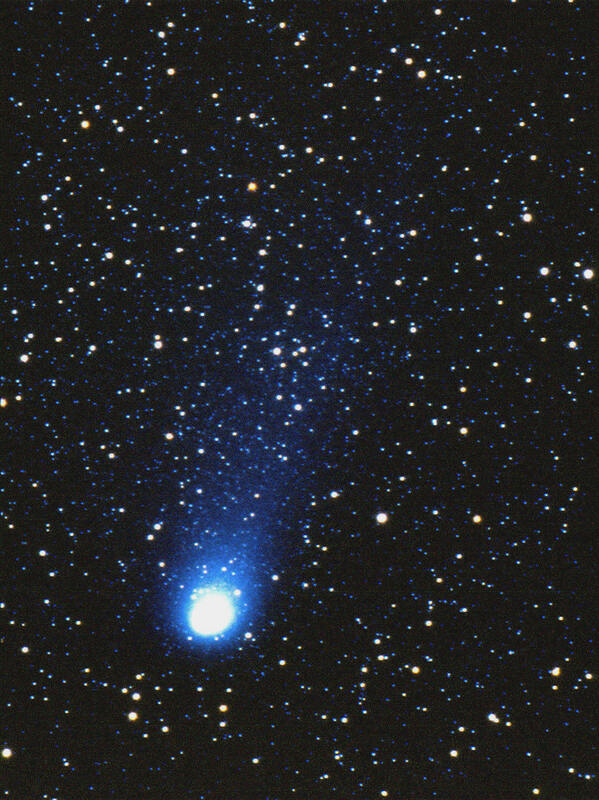 Dobsonians can be fitted with encoders to allow computer databases to be accessed for the detection of faint objects. The equatorial mount has a polar axis which is aligned parallel to the Earth’s axis, i.e. it is pointed up to the South Celestial Pole, 26.6o above the southern horizon at Nambour. By turning on the polar axis, the telescope moves in Right Ascension, and if moving towards the west at the correct speed (sidereal rate), will follow a star or planet. At right angles to the polar axis is the declination axis, which allows the telescope to move north or south, in Declination. A motor geared to the polar shaft can be made to move the telescope at the correct speed to track sky objects. These speeds are very similar, but not the same. They are solar, sidereal, and lunar. The image of an object moving across the sky is lifted to a greater or lesser degree by atmospheric refraction, so if the telescope is tracking a star where it ought to be, its image could be well away from that point. If the object is at an altitude of (say) 400 and setting, its speed of approach to the horizon will be gradually slowing due to refraction. Telescopes are often equipped now with a fourth rate of tracking called the King rate (after its inventor), in which the telescope adapts its speed to match that of the sky object, taking into account the object's height above the horizon and whether it is rising or setting. Good photography of sky objects often requires exposures as long as an hour or more, so the tracking must be very precise. To achieve this, the polar axis must be exactly parallel to the Earth’s axis, which means taking into account the fact that the stars used to locate the South Celestial Pole are themselves lifted by atmospheric refraction. Running at the sidereal rate, the polar shaft must rotate at one revolution in 23 hours 56 minutes. This means a number of gears, and usually a massive worm gear and wheel as well. All of these must be precision made, with no binding or backlash. There is usually a clutch on each axis to enable the mount to be swung manually, without putting a strain on the gears. These must always be used with care, in case the telescope is not properly balanced. Computer control has made a great difference to telescope driving in the last ten years. All gears have a periodic error, and a control computer can be quickly taught how to adjust the motor speed to eliminate these errors. This type of control is called ‘smart drive’. 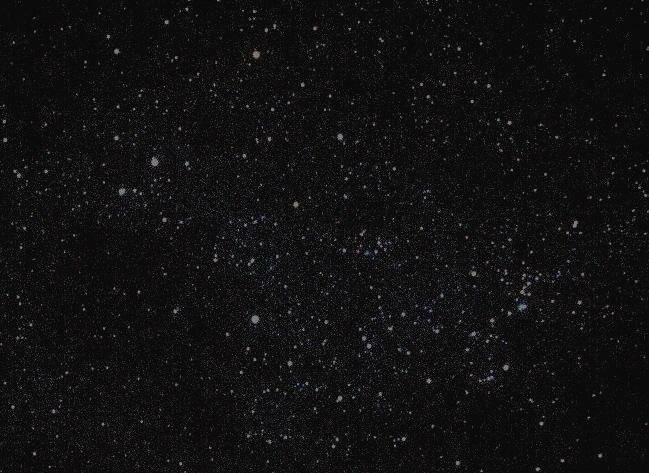 Computers can assist in the alignment of the polar axis, and can be used with autoguiders to follow sky objects automatically, thus relieving the astrophotographer of the job of watching a guide star for the duration of the exposure, while adjusting tracking errors with a hand control. Software is available which enables the telescope to find and track tens of thousands of sky objects. It also knows the position of the Moon and planets at any given moment. The accuracy of such software depends on the type of system driving the mount’s axes. If encoders are used, good accuracy is maintained, even if the clutches are released and the mount moved to another part of the sky manually. Often, mounts with stepper motors are used. These motors are computer-controlled to count the movements of their shafts in thousands of tiny steps. Greatest accuracy is achieved with servo motors. For best results, clutches on these mounts should never be released, and the mount moved to point at different parts of the sky by driving it with the motors. Mounts with all the above capabilities can be operated from computers at remote locations. They are called robotic mounts. 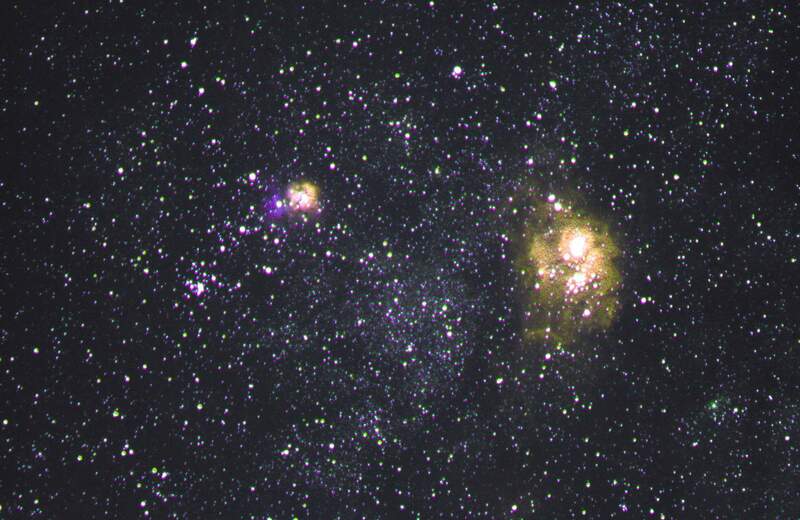 The Trifid Nebula M20 and Lagoon Nebula M8 in Sagittarius. The telescope pier should be a vertical shaft passing through the observatory floor to a firm footing. It should be mechanically isolated from the building, but will include conduits for electrical, video and data cables.